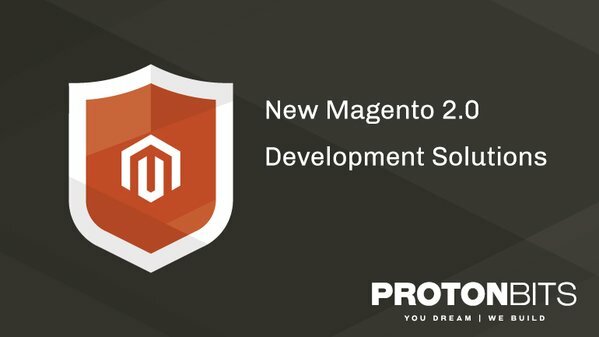 With the launch of New Magento 2.0, ProtonBits has geared up to offer its amazing functionality to clients. With expertise and experience to support it, ProtonBits has the necessary acumen to render quality solutions with Magento 2.0. NEW YORK - Feb. 10, 2016 - PRLog -- Magento 2.0 being open source solution for eCommerce along with adopting improved features of core products from Magento, businesses are set to gain. The enhanced features enable developers to offer high class functionality that will keep on growing with this platform. A steady building design along with further updates expected for adaptability and execution, Magento 2.0 has already risen many expectations. ProtonBits being an already established player for Magento eCommerce development and rated as a leading Magento development company, budding entrepreneurs can expect robust and agile solutions for their eCommerce ventures from ProtonBits. With New Magento 2.0, ProtonBits hopes to further enhance customer experience by building products that are technologically brilliant and incorporate all the new features offered by this platform. The growing need for making their presence felt across the web by businesses, has led to an increased requirement for eCommerce solutions. Being a responsible Magento development company, ProtonBits identified this need of businesses and aligned expertise with it to develop eCommerce solutions of highest standards. Moreover, for specific needs and focused attention to product building, ProtonBits also provides dedicated developers for Magento development; thus proving beneficial for clients. With an expert team that quickly adapted to using New Magento 2.0, providing more than satisfactory services has never been an issue with ProtonBits. Best results are always guaranteed; right from initiation of development to performance testing and final deployment. Most importantly, the pricing is competitive without compromise in quality parameters at any stage of development. With ProtonBits, eCommerce business aspirants can be assured of benefit centric approach and a team that will always rise to any complex challenge during development and render a product that is almost always beyond expectations. An exclusive and client centric approach for dealing with different needs, aids the company is conveying remarkable outcomes. The expertise put to practice and the quality of adapting to new technology means that all the latest features associated with Magento 2.0 will be leveraged for eventually producing a quality product. New Magento 2.0 as mentioned earlier has many improved features in comparison to its earlier version. This has surpassed all of its previous iterations. However, for utilizing these new features to full potential, expertise and a quality to adapt and execute to perfection is required. This is exactly what is gained with associating with ProtonBits. There are many companies that offer Magento development services and few have also started with Magento 2.0; however, when it comes to selecting the best Magento development company amongst the lot; one that has potential to use new features of this platform, ProtonBits leads the pack. This has been proved by many satisfied customers already in its kitty. ProtonBits is backed by around half a decade of experience in eCommerce development, website development, mobile apps and SEO. Within a short span of time, the company has reached many milestones and has already worked with more than 100 clients globally. With the recent foray into New Magento 2.0 development, the company has added one more feather to its already vibrant portfolio.